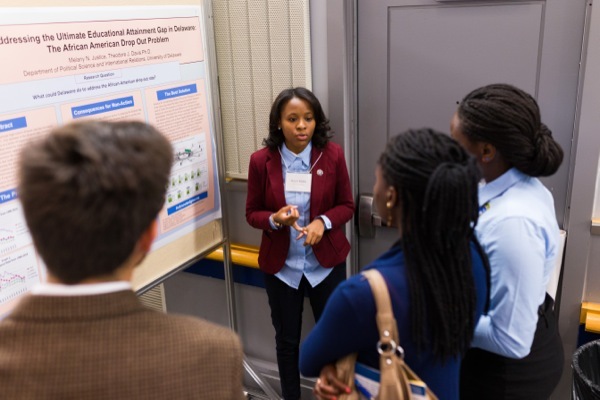 UD hosted the National McNair Scholars Research Competition and Graduate School Fair on Oct. 18. UD junior Joseph V. Kerridge explains his research during the National McNair Scholars Research Competition and Graduate School Fair. Natalie Rivera-Torres of Delaware State University believes in the importance of communicating scientific research to the public. 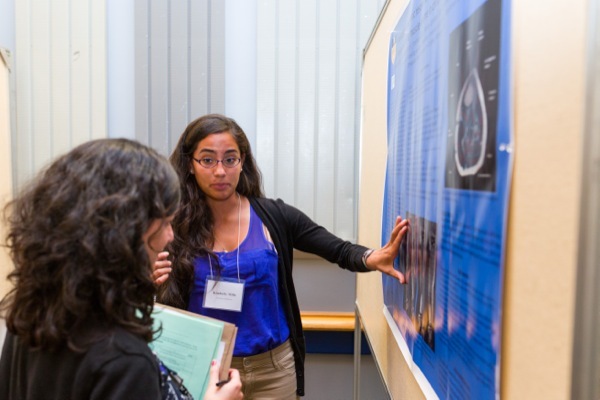 UD's Kimberly Milla won in the science category in the National McNair Scholars Research Competition and Graduate School Fair poster competition. Students had an opportunity to discuss their research during the National McNair Scholars Research Competition and Graduate School Fair. 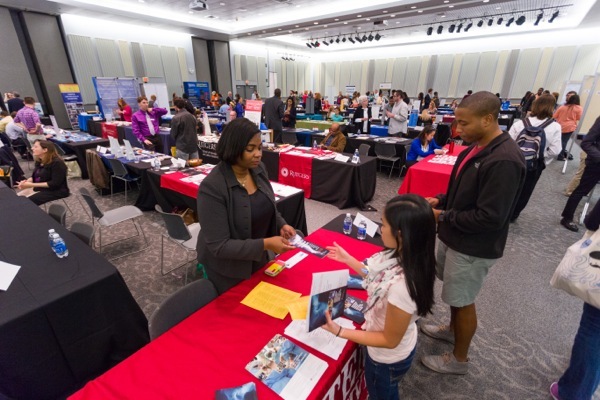 A wealth of information was available to students during the National McNair Scholars Research Competition and Graduate School Fair. 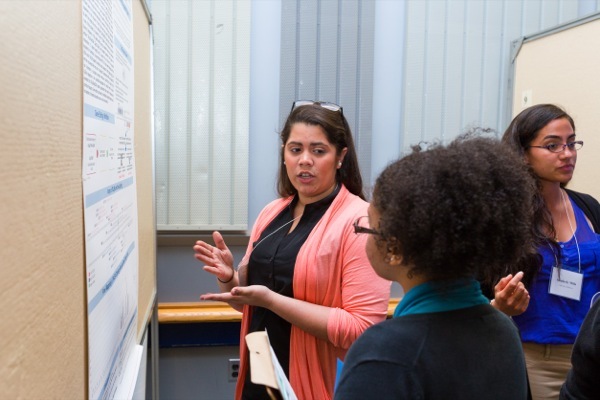 UD's Melany Justice explains her work during the National McNair Scholars Research Competition and Graduate School Fair. 8:42 a.m., Oct. 24, 2013--Joseph V. Kerridge from Breinigsville, Pa., really likes chemistry. It’s wired into him, just like his career goal to become a university professor. 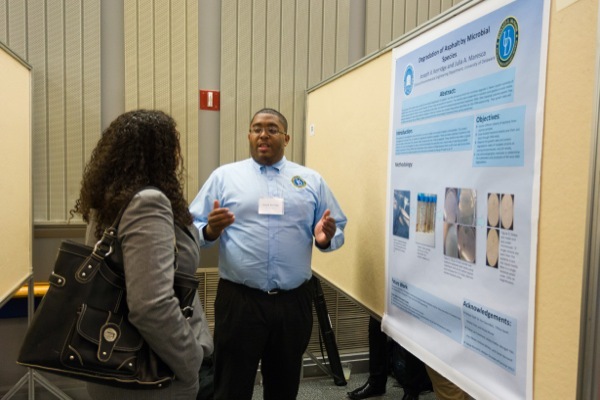 This past Friday, Kerridge, a junior McNair Scholar majoring in chemical engineering at the University of Delaware, had the opportunity to do what many university professors do: he presented a scientific poster highlighting his research, on bacteria that degrade asphalt. The venue was the National McNair Scholars Research Competition and Graduate Fair, an event that UD’s McNair Scholars Program has hosted for the past 11 years. UD is home to one of 158 McNair programs nationwide. More than 80 percent of the University’s McNair Scholars enroll in graduate school immediately after bachelor’s degree attainment, continuing their studies all the way through the doctoral degree. The participants are either first-generation college students with financial need or members of a group that traditionally have been underrepresented in graduate education and have demonstrated strong academic potential. 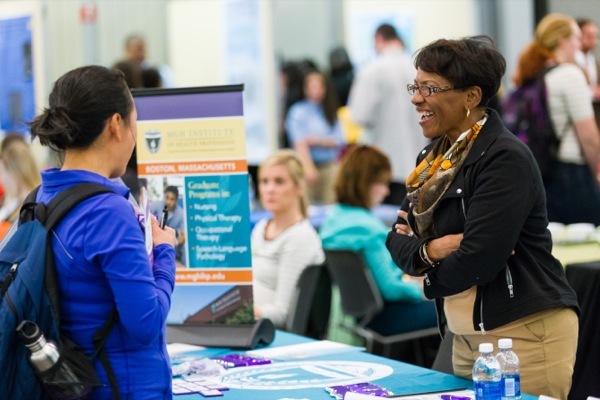 More than 350 people attended the day’s activities, which included seminars on graduate admissions and a graduate school fair featuring 83 graduate programs from universities in California to Delaware to the United Kingdom. But the highlight for Kerridge and his co-presenters was the research poster competition. Kerridge said he collected bacterial samples from roads around Newark, Del., and then examined them in the lab under the guidance of Julie Maresca, his faculty adviser. He analyzed the bacteria using high-performance gas chromatography to determine what microorganisms were present and to monitor their growth under various conditions. “The ultimate goal is to figure out how to modify the bacteria to have them fix the asphalt instead of degrade it,” Kerridge explained. Natalie Rivera-Torres, a graduate student in general biology from Delaware State University, is working with Eric Kmiec on the development of gene therapies to treat sickle cell anemia. “I like to learn the why and the what,” she explained. 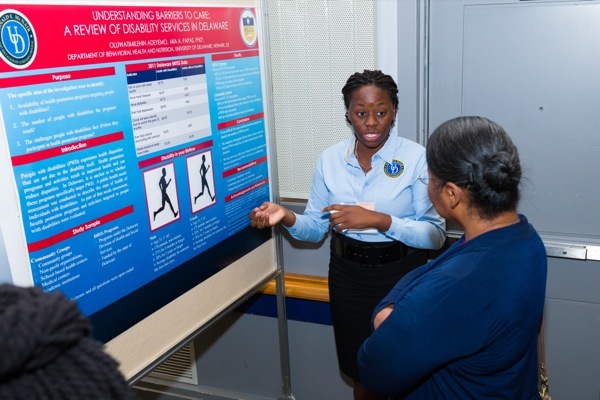 Kerridge and Rivera-Torres were among 57 students from UD, Delaware State University, Cheyney University and Wesley College who participated in the research poster competition.